Rocktype QEMSCAN petrography service, providing porosity, bulk chemistry and mineralogy, grain counts and size distribution, morphology of rock matrix, clay and cement volumes. 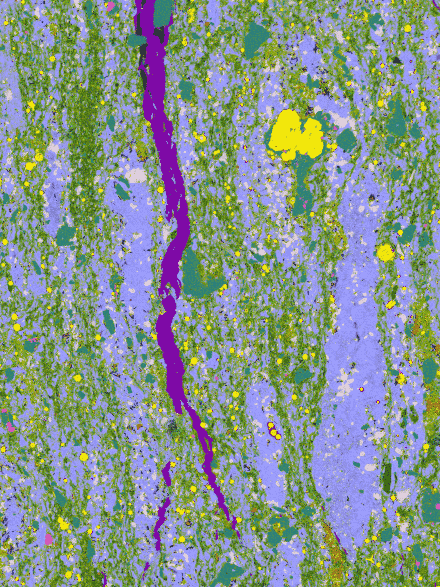 QEMSCAN® by FEI is an automated mineralogy system producing rich digital petrography data. These fully digital data sets are valuable inputs for subsurface workflows, including petrophysical modelling, basin modelling, reservoir quality assessment and sediment provenance. Rocktype works closely with FEI as a technology development partner for the oil and gas industry and is one of a handful of geological consultants providing commercial QEMSCAN services globally. A traditional petrographic workflow combines optical petrography for modal mineralogy and textural data with X-ray diffraction (XRD) for bulk chemistry and clay typing. QEMSCAN analysis saves time and money by generating all these data in a single process with a resolution and numerical detail not available from other techniques. Rocktype provides a flexible set of QEMSCAN services tailored to the oil and gas industry. These can be purchased separately or in combination and are available on core, cuttings and sand. The products are defined in terms of the resolution and the total scan area. A coarse resolution scan is a cost effective source of bulk porosity and mineralogy data while finer resolution gives greater insight into morphology and boundary phases. 25 samples of sandstone and mudstone scanned at 50 µm resolution. A fast and affordable alternative to optical point counting or XRD, this 50 µm scan provides robust mineralogy and porosity values from 40 000 data points. 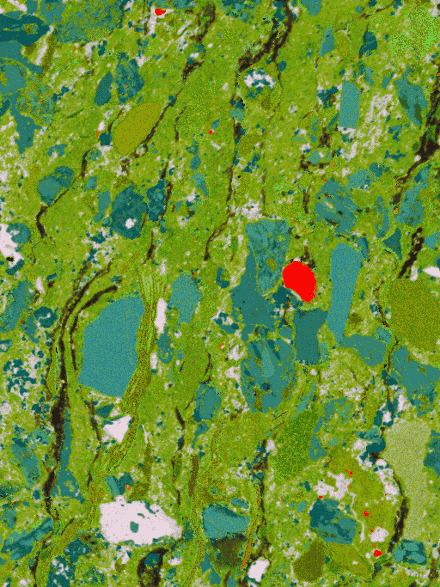 10 µm scan of North Sea sandstone. A 10 µm scan provides high resolution images from a 10 x 10 mm area providing 1 million data points. This enables the study of size distributions for porosity and grains. 4 µm scan of mudstone from Colombia showing fossils and calcite deposits. This high resolution scan enables detailed study of mineral association, pore shape, grain size distribution and pore-lining clays. The 4 µm scan of a 4 x 4 mm area yields 1 million data points. Rocktype provides consulting services based on our QEMSCAN data. Rocktype also provides consulting services using QEMSCAN data, including reservoir quality assessment, provenance studies and log calibration.